There are two semi-circular discs located in the knee, between the upper leg and the lower leg. These are the inner meniscus and the outer meniscus. They can become damaged through acute injury or through ageing and wear-and-tear. Injuries to the meniscus are often seen in combination with a cruciate or knee ligament injury. 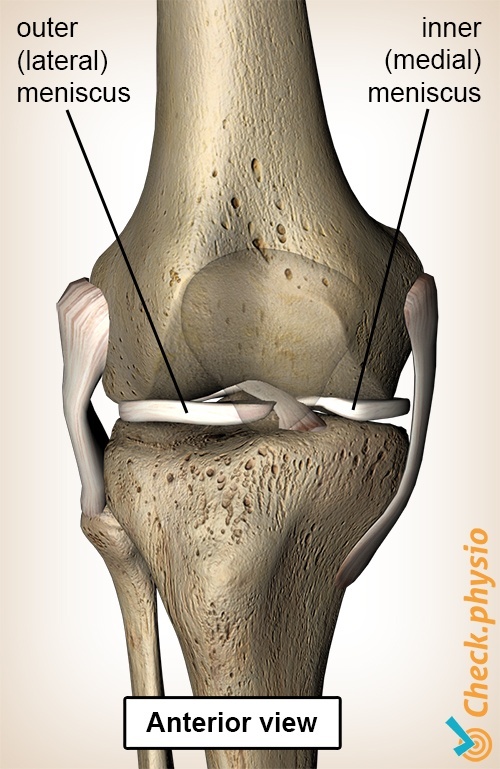 The main function of the menisci is to distribute the pressure in the knee joint. The rounded base of the thigh bone (femur) does not fit properly on the flat top of the lower leg bone (tibia). The inner and outer menisci ensure that both bone parts fit properly without resulting in point pressure. Both menisci also act as shock absorbers and have a proprioceptive role. 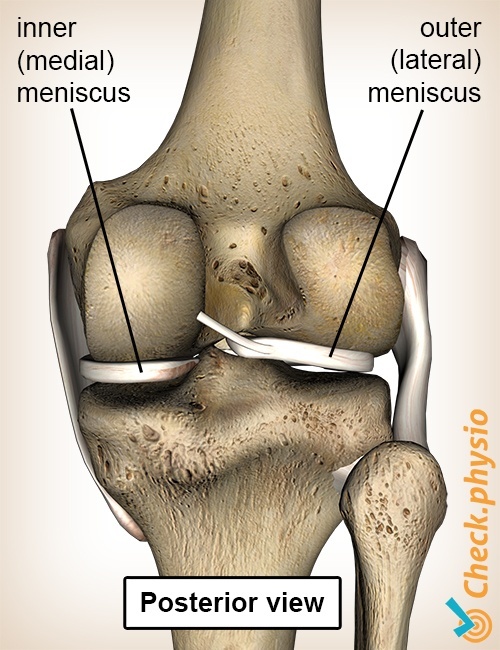 Proprioception in this case means that the meniscus - as is the case with many other structures in the knee - is able to provide the body with information about the position of the knee. For example, we can feel whether the knee is flexed or extended. In the case of an acute meniscus injury, a tear occurs in the inner and/or outer meniscus. This tear can occur in various forms and causes pain when force is exerted on the damaged meniscus. This is similar to pushing or pulling on a wound. Sometimes a torn piece of meniscus can lodge in the hinge part of the knee. This can block movements of the knee. The acute meniscus injury is characterised by a single moment at which the symptoms occur. This usually occurs when the flexed knee is twisted whilst the foot is on the ground. A snapping sound or sensation can be experienced and the knee will swell after several hours. If the symptoms occur gradually or through over-exertion, this can point to a degenerative meniscus injury. The pain is usually felt on the side of the torn meniscus. Walking up and down stairs, crouching and weight-bearing rotational movements of the knee are painful. Locking problems can also occur. The knee is suddenly unable to flex or extend fully, because a part of the meniscus is trapped in the joint. There are a number of physiotherapeutic tests that can confirm a meniscus injury. An MRI can be considered if there is any uncertainty. It is also important to examine other structures in the knee for possible damage. If the tear is not too big it can heal without intervention. The physiotherapeutic treatment is aimed at optimising the recovery through exercises that stabilise, strengthen the muscles and stimulate proprioception. Pain, swelling, locking symptoms and a large tear all form indications for surgical treatment. There are many options for treatment that can be discussed with the orthopaedic surgeon.